my dear friends at erased tapes are celebrating five years of being a record label. 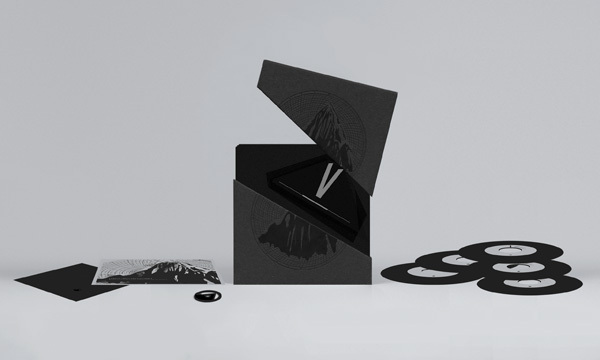 and they’ve put together a rather deluxe box of five 7″ records, with ten exclusive tracks from the label roster. along with some of the other labels i’ve been privileged to work with over the last years, these folks have supported me and my musical habits in a way that i am eternally grateful for. so when they asked me to make a song for their five year anniversary compilation, of course i didn’t hesitate for a moment. robert raths (label founder) actually said to me, ‘i want you to make the best song you’ve ever made’. and although he was kind of joking, i took him rather seriously and set out to push my own boundaries a bit and make something special for him. i suppose as a recording artist i should always set out to make the best thing i can, and i think i do . . . but something about that comment from robert gave me some real motivation. so in the spirit of the five year celebration, i wrote a song in 5/4 timing, and made it exactly five minutes long. it’s called GIVE A SMILE IN 5. and i must say, i’m very proud of this odd little track . . . i had recently acquired a bunch of new studio gear at my place in berlin, so i was able to explore some exciting new sonic territory (think deep bass and tape delays). normally i would post the song here for streaming, but erased tapes has decided to make this compilation for vinyl buyers only until december, when a digital version will be available. so, if you can afford it, do think about supporting these wonderful folks and indulging in a very special item! This entry was posted on Friday, July 19th, 2013 at 12:05 am	and is filed under News. You can follow any responses to this entry through the RSS 2.0 feed. You can leave a response, or trackback from your own site. where will I be able to purchase/hear the best song you’ve ever made? well, i wouldn’t claim that it’s the best song i’ve ever made . . . but i did record the song with that goal in mind… for now it’s only available through the erased tapes box set. but come december, i do believe the compilation will be available digitally, so if the box set is too expensive, you should be able to hear it for much cheaper then. Congratulations on the five year anniversary! Looking forward to checking out the new song and the rest of the compilation. I’m a big fan of Erased Tapes & your work in general and I’ve been lucky enough to see you perform live several times, both solo and as part of the fantastic Efterklang. The performance in Eindhovens Catharinakerk in 2012 and the one in Amsterdam earlier this year were just brilliant. Although I still love Efterklang (seeing them again in september! ), I was very sorry to see you go.